We couldn’t find much to fault CBDfx with these gummies. The only thing we can say is that if you’re trying to keep your sugar intake low, you may be better off taking one higher dosage gummy like Hemplucid’s than a few of these. Or you can use it as your treat of the day, which is what we did. 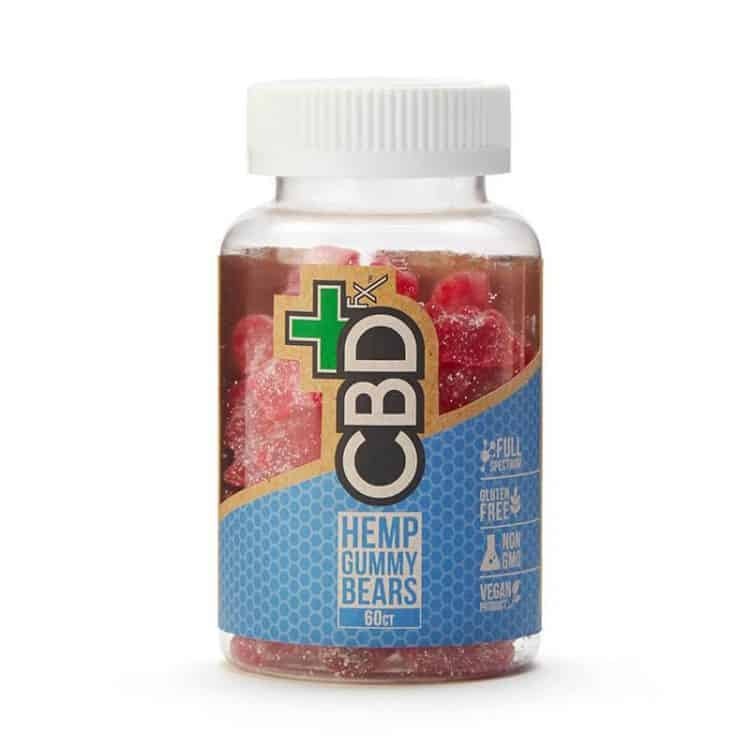 We thoroughly enjoyed the CBDfx CBD gummy bears and they really did the job. The CBDfx gummies are up next to be reviewed, and we’re excited. These are good looking gummies that we’ve been wanting to try for a quite some time. 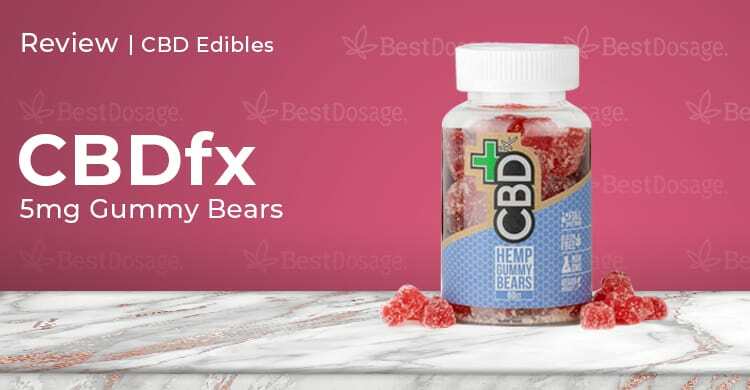 These gummies are probably the flagship product for CBDfx, and naturally come up front and center when you load their website. The CBDfx gummies are 100% vegan CBD gummies, which CBDfx claim was the first on the market. They’re also gluten-free. The gummies are berry-flavored, non-GMO and contain no corn syrup or artificial sweeteners. The first thing we noticed is that CBDfx packages their stuff really well. This is just a bottle of gummies, but we really liked how they designed their packaging and highlighted all the relevant information. That always makes you feel better when taking something for the first time. After making that observation, we dived into them because they just looked so tasty. Their looks were not deceiving us – these indeed were very yummy! They’re a basic berry, but remind you of the flavors you loved as a youngster. They also aren’t overly sweet, which does happen sometimes, and overall they were just fun to eat. It would have been nice to have some flavor variety anyway, just to change things up, but no real complaints on the flavor. They also had a good feel and were very pleasant in your mouth and in each bite. For anyone who’s ever had a hard plasticky gummy bear before, you’ll know what we mean. These were soft and had the right texture. In our experience, you’re going to have to take at least 2 or 3 CBDfx CBD gummies to feel something. Officially the number is 1-2, but remember each contains 5mg of full spectrum CBD, which isn’t a lot. For those that are veterans of CBD, you may end up taking 4 or 5. Having these microdoses means you can up your dosage slower and more accurately. You should also wait a few hours just to feel the full effects. Some people like to take them at night, while others split them throughout the day. We liked having a few early in the day and then another pair in the afternoon. As for how they make you feel, obvious it will be different for each person in some way. It definitely provided some great sleep for some of us. While for others it helped with pain relief and anxiety. It was fun having smaller doses of CBD per gummy because you could really eat it as a treat to satisfy your sweet tooth. Having just one will leave your taste buds desiring more, so in that way, it’s nicer to be able to be able to enjoy several, all thanks to micro-dosing. Organic cane sugar, organic tapioca syrup, water, organic seaweed extract, natural flavors, and colors, organically grown CBD rich hemp oil. CBDfx does a great job with customer support, giving you a variety of contact options. You can send them an email, call them on their toll-free phone number, and engage in live chat on their site. Responses were rather speedy, and their customer reps were friendly and helpful. We couldn’t find much to fault CBDfx with these gummies. The only thing we can say is that if you’re trying to keep your sugar intake low, you may be better off taking one higher dosage gummy like Hemplucid’s than a few of these. Or you can use it as your treat of the day, which is what we did. We thoroughly enjoyed the CBDfx CBD gummies and they really did the job.